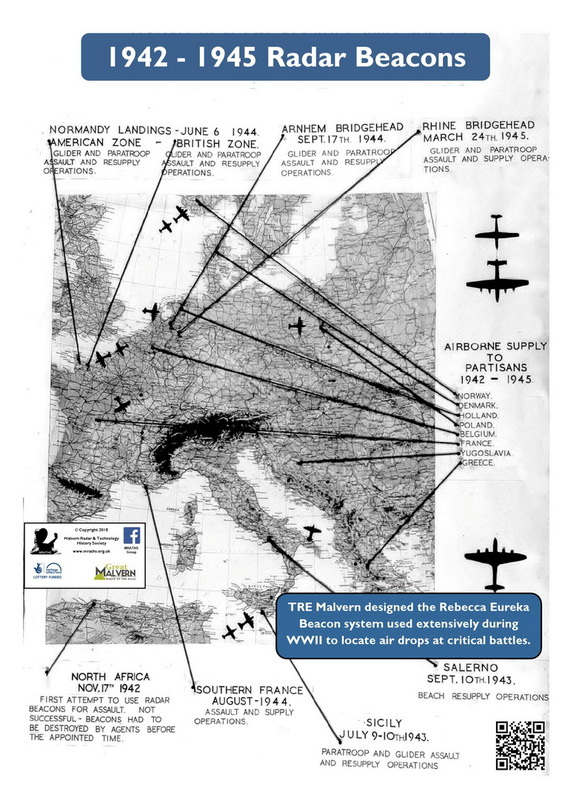 REBECCA-EUREKA was a radar beacon system to guide drops from aircraft. The system has an airborne part named Rebecca, and a ground deployed part, Eureka. Rebecca comprises a high power transmitter radiating from the nose of the aircraft and a receiver and display for use by the navigator. 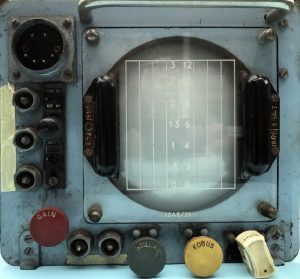 The display was based on the Anti Surface Vessel (ASV) radar display. The receive antennae are mounted on either side of the fuselage and thus provide difference signals to assess bearing to the beacon. 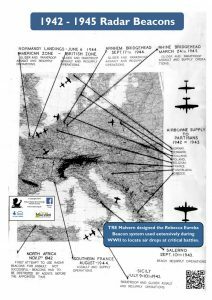 Rebecca was fitted to many British aircraft types and in late 1942 some were fitted to US aircraft operating from British airfields to support the invasion of Sicily. At this time Hanbury-Brown was sent to America to explain the system to them and persuade the Americans to build a fully interoperable version. American Rebecca designated AN/PPN-2 was manufactured in Campden NJ. By 1944 Dakota aircraft arriving in the UK were so equipped. 500 µsec pulses are transmitted at a radio frequency around 220MHz and at a pulse repetition frequency of 300Hz. The beacon operator powers up the ground receiver to a pre-arranged time. When the approaching aircraft signal is heard the beacon responds on a different radio frequency to the transmission from the aircraft. Detection ranges for a clear beacon site are from 50-30 miles. Incidentally this frequency is still allocated for land mobile and broadcasting purposes today. VARIANTS: There were several variants built. Mk I was designed at TRE Worth Matravers and manufactured by The Master Radio Company and used by SOE. It used single channel transmit and receive frequencies. Rebecca-Eureka Mk II added five channels to reduce the likelihood of co-channel interference and interception. It also added the neat feature that allowed an operator to transmit morse code by key on the front panel. This proved useful by allowing for example, confirmation that the drop could proceed safely as the drop zone had not been compromised. These sets were also fitted with a self destruction charge which could be initiated externally. They blew up after a ten second delay! The sets were manufactured by Murphy Radio and used b SOE, Secret Intelligence Service (SIS), and the RAF. These sets were used extensively during the D-Day Landings in June 1944 (Operation Overlord). Despite the provision of five radio channels there was still much mutual interference because so many sets were deployed. Rebecca-Eureka Mk III (& IIIB having only two RF channels) was a more compact, lighter set designed specifically for use by French resistance and was manufactured by Cossor. One version of Mk III Rebecca-Eureka ) was built in America (Eureka designated AN/PPN-2 and Rebecca designated AN/APN-2). It was built by Hazeltine Electronics in large numbers and to a higher mechanical build standard, albeit that it was more fragile. However the receiver performance of the early version was inferior to the British design, as evidenced by a comparative challenge trial set up by Hanbury-Brown. Later models used his receiver design. Like the British versions it was used by special forces, resistance movements and airborne forces. By 1945 Rebecca Euerka MkIV offered a speech transmission for aircraft and troops engaged in airborne operations. Unsurprisingly this was designated Talking Rebecca-Eureka. Much of the design work and the rapid preparations for D-Day were conducted by TRE at Malvern College in House X and their Engineering Unit off Geraldine Road, Malvern.